Bigfoot Barleywine is a craft beer legend. Each winter, this beast of a beer appears and wreaks havoc on unsuspecting palates with its intense bittersweet flavors. This year—in honor of the 30th Anniversary of this style-bending brew— we’re releasing a very special version of this cult classic: Aged in oak whiskey casks for nearly two years, this barrel-aged Bigfoot is incredibly complex. The assault of resinous hops has mellowed, and the influence of the wood has shifted focus toward the malt—with rich burnt-sugar flavors and notes of vanilla, toasted coconut, and raisins. Grab this elusive beast while you can, because it won’t be around for long. Bigfoot is a beast of a beer, brimming with bold flavors of bittersweet malt and heaps of aggressive whole-cone Pacific Northwest hops. First introduced in the winter of 1983, Bigfoot is a cult-classic beer brewed in the barleywine style, meaning a strong, robust, bruiser of a beer with the refined intensity of a wine. Bigfoot is prized by beer collectors for its supreme cellarability. Under the proper conditions, it can age like a fine wine, developing new flavors and character as it matures in the bottle. Each new release or “expedition” is vintage dated. Collect your own and see the flavors develop and progress. Hop Hunter IPA harnesses the complex flavors of just-picked hops through an all-new method of steam distilling wet hops before they even leave the fields. This revolutionary technique captures and intensifies the natural flavors, creating a unique and intensely aromatic beer. Our custom process gathers pure hop oil which, when combined with traditional whole-cone hops in the brew kettle and in our Hop Torpedo, makes for an incredible IPA experience. Infinitely complex in aroma and flavor with notes of maltiness and tartness throughout. An unsurpassed old brown with the richness and complexity of a vintage wine. Goudenband & Oud Bruin blended with cherries. Not a lambic. Our most heavily hopped beer ever bursts forth with unmistakable tropical fruit and pine hop aromas and flavor supported with a slightly sweet malt character, tapering to a crisp, dry finish. Heed your call and enjoy. Each year Brasserie de Silly takes their famous Scotch Silly brand and ages it in a different style barrel. 2014 features Cognac Barrel Aged Scotch Silly. This deep dark colored scotch ale is a perfect blend of carmelized malt and candied sugar from the mother beer with the dry favor coming from the Cognac barrel to produce a brew that explodes with flavor. Barley wines are traditionally hefty brews, but ours is downright excessive. The huge maltiness of this beer is only tamed by an equally prodigious addition of hops, creating a rich, slightly sweet, caramel-hued ale infused with assertive bitterness and bright hop notes, all culminating in a pleasing dryness. 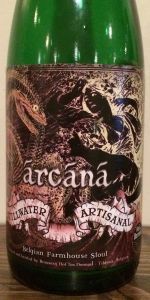 While it will evolve into an even more glorious brew with age, this beer’s delicious onslaught of flavors will seriously challenge your ability to wait any longer to drink it. 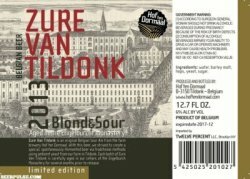 Zure Van Tildonk is an original Belgian Sour Ale from Farm-Brewery Hof Ten Dormaal. With this beer, the brewery strived to create a special, spontaneoussly-fermented beer via traditional methods using ambient yeast from the brewery-farm in Tildonk. Each batch of Zure van Tildonk is carefully aged in the cellars of Engelburch Monastery for several months prior to release.